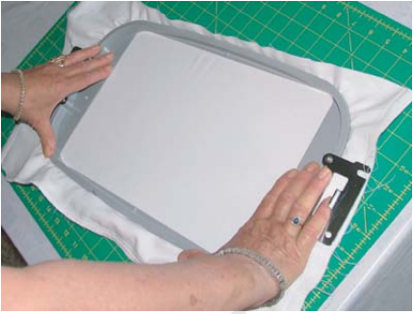 Organza, a fabric traditionally made from silk, is a thin sheer fabric. Using Organza can be very effective when sewn on items like pillows and blouses (where you would not want open holes showing through). 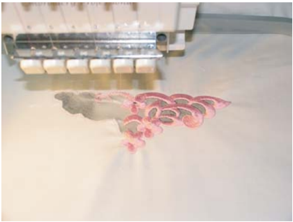 Cutwork in itself is a beautiful medium that adds elegance to almost any embroidery project. A cutwork design that’s done for home décor is visually appealing and gives a warm vintage feel. 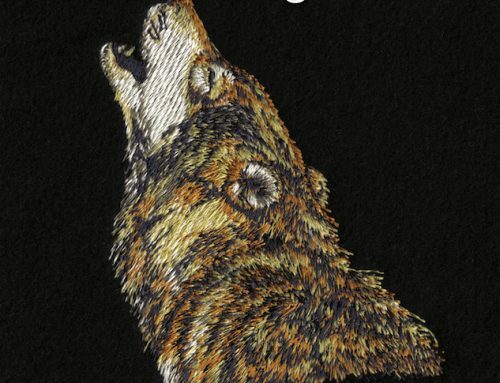 The same design embroidered on a wearable item has the same result. 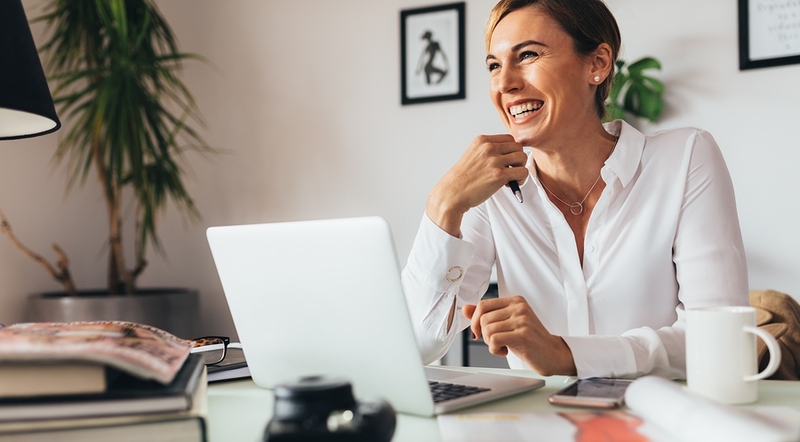 Although at times, it can produce some problems… The first issue is that the cutwork might expose the area and become too “revealing”, especially if done on a blouse. 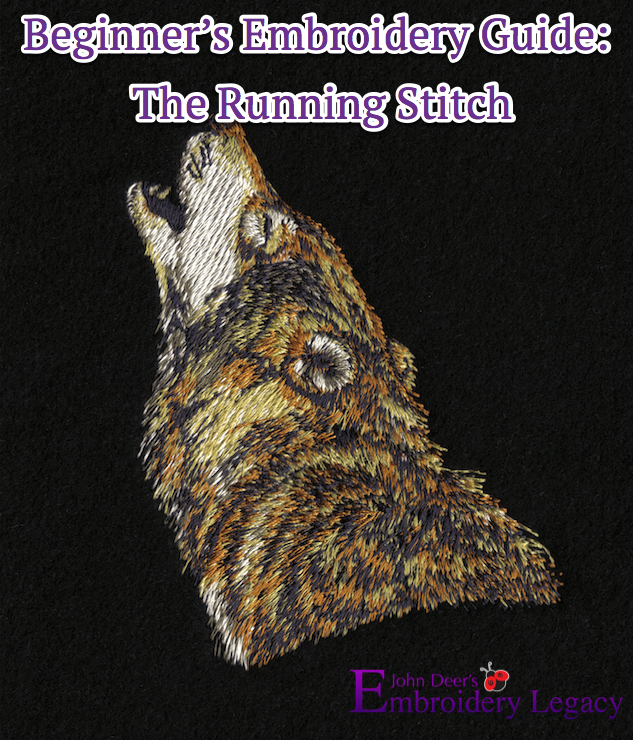 Secondly, it would need to be laundered delicately, or the embroidered area could unravel and ruin the item completely. In these circumstances, I like to use organza in the process to add visual appeal as well as some “structure” for the embroidery. 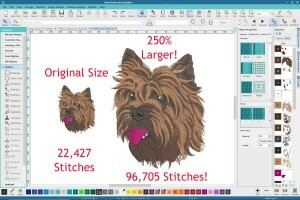 Using organza can really spice up any embroidery project, By following these simple steps, organza can be added to any existing embroidery cutwork design. 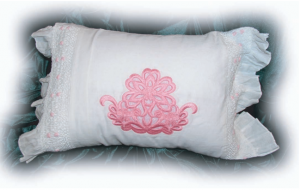 For this example, we will be using a pillow for our project. 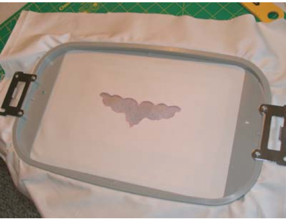 Iron a piece of No Show Fusible Mesh backing to the back side of the item you will be embroidering. Hoop the item that you’ll be embroidering. 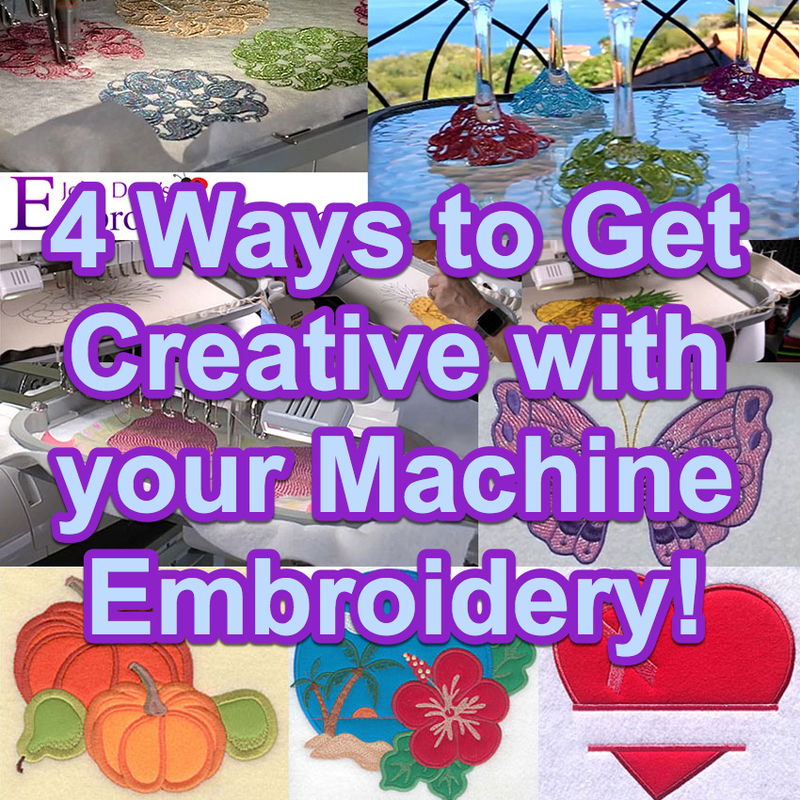 Place and secure the hoop onto your embroidery machine and embroider color number 1. 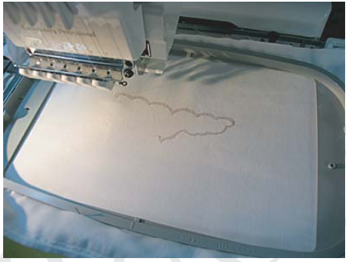 This will lay an outline stitch for the cutout area. Remove the hoop from your machine and use your Rotary Cutter to make a small slit in the cut-out area. 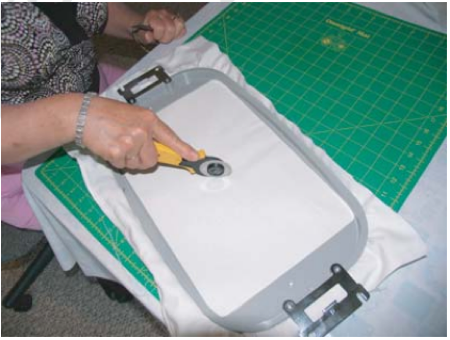 This will allow you to easily get your scissors into the area you will be cutting out. 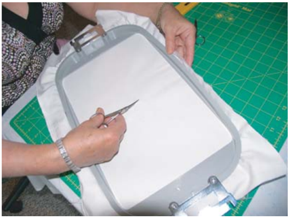 Take a pair of small sharp scissors and carefully cut just inside the area where the cutting line has been embroidered. 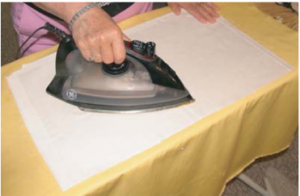 Take your time and cut as closely as possible without cutting into the stitched line. Cut a piece of water-soluble self-adhesive backing to fit over the area that you’ve cut. 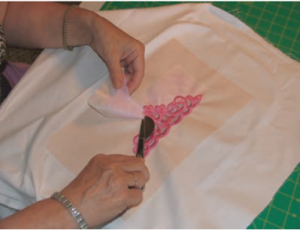 Cut one or two pieces of the organza slightly smaller than the backing. Tip: You may want to use two pieces of the Organza so that the open holes will not be quite so transparent. 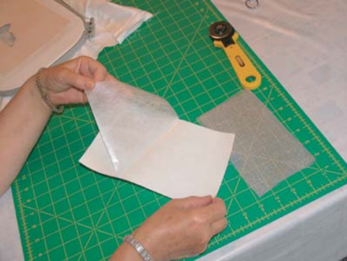 Peel the Water Soluble Self Adhesive backing from the paper and lay it on a table with the sticky side facing up. 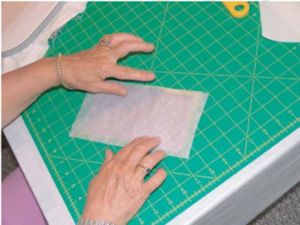 Take your Organza and place on the sticky side. Press gently and evenly into place. 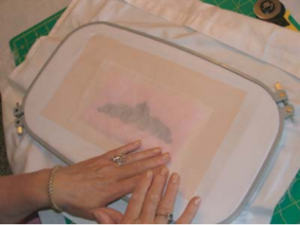 Make sure that you leave enough area around the organza so that there will still be sticky parts of Water Soluble Self Adhesive backing on all four sides to attach to the back side of the fabric in the hoop. Turn your hoop over, so that you can work with the backside. 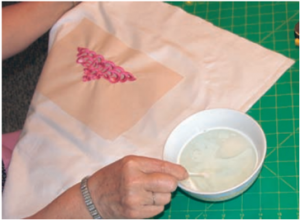 Next take your water-soluble self-adhesive backing with the Organza attached and gently press into place over the cut-out section of the design. Turn your hoop over once again, so the front side is once again presented, and make sure the entire open area is covered with the Organza. 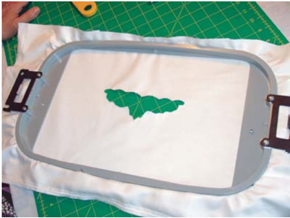 Place your hoop back into the machine and embroider the 2nd color. 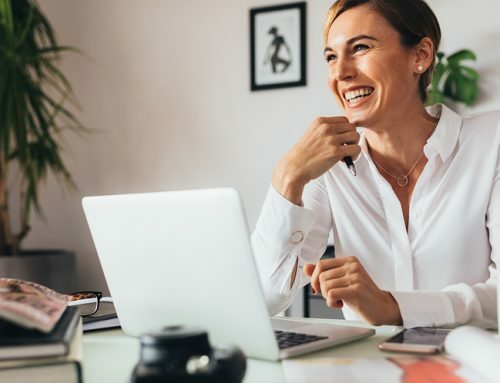 This will give you the tack down line. 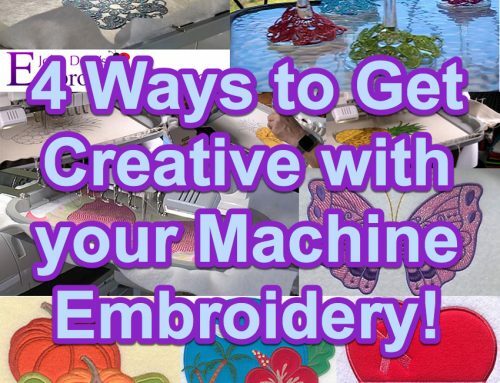 Embroider the rest of your design until completed and remove the hoop from the machine. Remove the completed item from the hoop and turn it over. Peel the water-soluble self-adhesive backing from the material and cut it, along with the Organza, as close as possible to the stitching without cutting into the embroidery. For the last step, take a small bowl and pour hot water into it with a drop of dish soap. Take your cotton swab and dip it into the water. 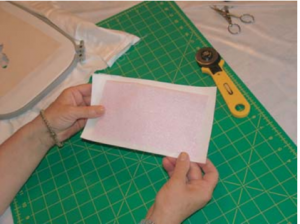 Take the cotton swab and gently rub and wash away the sticky residue of the Water Soluble Self Adhesive backing from each segment where the Organza is. You can also use your fingers to remove any excess residue. Gently hand rinse item when complete. 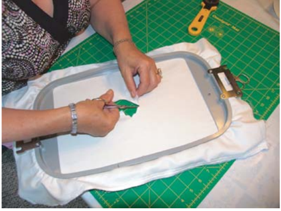 Adding organza within a cutwork design is both effective and easy to do. 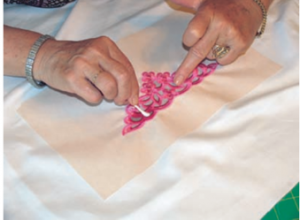 Although logic would dictate that it’s just like applying an applique, it’s actually very different because the organza has more stability when done this way. 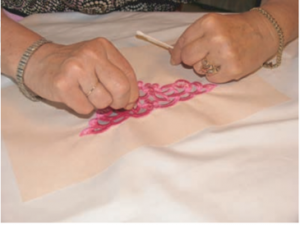 Also, the strength of the design increases, as all the stitches of the design are holding onto the organza. 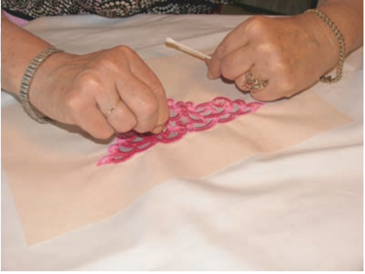 Embroidering with this technique gives you the ability to play with different colors, types and other sheer material such as tulle. 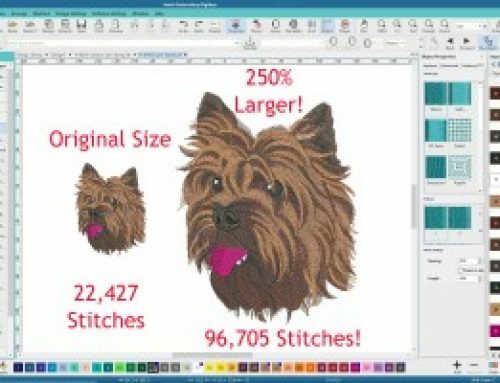 I hope you’ve enjoyed this quick tutorial & have fun creating your first cutwork organza project! Thanks Ingrid, glad you enjoy it!